Outside Club 56. Photo by RANDREAC. Article originally published November 12, 2013 by The Grid online (thegridto.com). It was a dark, dingy death-trap. But in the early 2000s, there was no better place to party than in this Kensington basement. 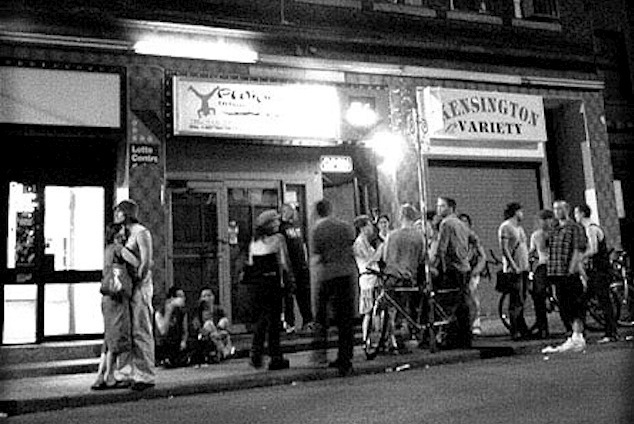 Club: Club 56, 56C Kensington Ave.
History: In the early 2000s, Kensington Market was not much of a destination for dancing. Market nightlife mainly consisted of punk and reggae shows, the occasional low-key lounge or restaurant, impromptu gatherings in the park, and boozecans. Streets tended to be quiet by night and busy by day, when people flooded in to buy vegetables and second-hand clothes. Squeezed between random storefronts and a TD bank machine, 56C Kensington was easy to miss. Its glass-door entrance was set in from the sidewalk, and was frequently covered in posters. Layers of paint hinted at the location’s past lives, including as an after-hours and, before that, a Vietnamese karaoke bar. By 2001, a man named Laszlo or Leslye (the English translation) owned the basement bar that came to be known as Club 56. At first, his clientele consisted largely of friends, many of them fellow Hungarians and other Eastern Europeans. It was a social club of sorts. That same year, a DJ and promoter named Mike Wallace was searching for a new spot to throw his parties. He and Rob Judges—two Scarborough-raised music lovers who’d been friends since grade four—had made names for themselves through a party called Skeme. From 1995 to ’97, the duo scoped underused spaces, bouncing from legion halls to Ethiopian restaurants, Kensington’s Lion Bar and Top o’ the Market and, most successfully, to Spadina’s Club Shanghai.